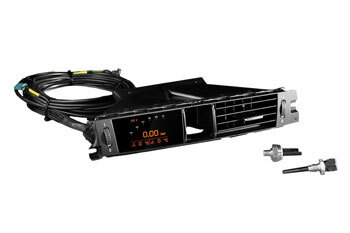 The Awron DGA Gauge is an all-in-one display unit that presents a wide array of real time data for the E9X M3. Featuring a sharp, full color OLED display, the Awron DGA gauge is easily controlled using the factory steering wheel buttons for on the fly commands. By replacing one of the factory air ducts the DGA gauge flows seamlessly with the M3's interior. All Awron gauges ship expertly pre-assembled into an OEM air duct piece. The effect is stunning, creating an OEM look and feel that is hard to distinguish from BMW's own quality. The predominantly orange colors used in the display match the M3's gauges nicely. This 20-in-1 gauge is the perfect option for track enthusiasts, supercharged cars or for those just wanting to add some flair and functionality to the M3's interior. The included plug and play harnesse make the job of installing this many gauges easier than ever.